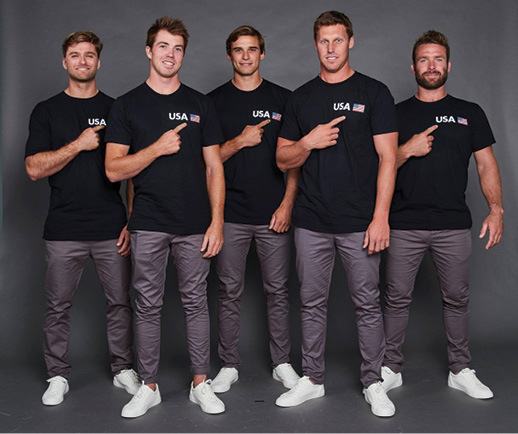 The United States SailGP Team roster includes Rome Kirby (Newport, RI; skipper & helmsman), Riley Gibbs (Long Beach, CA; wing trimmer), Hans Henken (Coronado, CA; flight controller), Mac Agnese (Fort Lauderdale, FL; grinder), and Dan Morris (San Francisco, CA; grinder). Rival teams represent Australia, China, France, Great Britain and Japan. The 5-event series will be sailed in identical F50 foiling catamarans capable of speeds exceeding 50 knots. Each grand prix, utilizing short-format, inshore stadium racing, will feature five fleet races leading to a final match race between the two leaders. Points will be accumulated in each race throughout the season, culminating in a $1 million winner-takes-all match race between the top two teams for the SailGP Championship. The first SailGP event is in Sydney, Australia on February 15 & 16, followed by two grand prix in the U.S. (San Francisco, CA on May 4 & 5 and New York, NY on June 21 & 22). Next up is Cowes, UK on August 10 & 11. The series wraps up in Marseille, France on September 20 – 22. For more information and to purchase tickets, visit SailGP.com. Work Vessels for Vets (WVFV), a West Mystic, CT-based non-profit organization with a mission to equip America’s returning veterans with the tools they need to start a business or pursue career education, has embarked on their second decade of making a difference for men and women who have served our country. 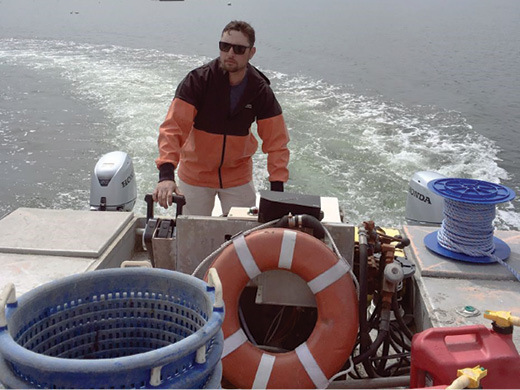 In 2008, John Niekrash, a lobsterman in Noank, CT, gave his lobster boat Krasher I to a U.S. Marine Corps Reservist in Rhode Island so he could learn a new trade, recover from severe injuries sustained in Iraq, make a living, and feed his family. That act of kindness gave birth to Work Vessels for Vets, launching a nationwide legacy that has provided equipment to injured veterans. In ten years, more than 1,800 veteran-entrepreneurs in all 50 states have received “vessels” of all types worth nearly $3 million! These new businesses have hired thousands of fellow veterans. Not even Co-Founder Niekrash could believe that WVFV would grow exponentially and give not only boats but also cars, trucks, vans, computers, tractors and more to enable veterans to start their own businesses all across America. Their mission is embraced nationwide, with funding from Newman’s Own Foundation, Home Depot Foundation, The Mission Continues and hundreds of individual donors. Work Vessels for Vets was founded on the simplest of gifts – a “hand up” in the form of a boat for an injured Marine so he could make his way after military service. That gift has multiplied again and again, as “vessels” taking thousands of wounded veterans to bright futures as business owners, employers, neighbors, and respected members of our community. To learn more and make a donation, log onto WVFV.org or call 860-536-4418. The ORR handicapping system assumes that the wind will blow at a certain strength from varying angles for the duration of a race. An individual yacht’s polars then define how fast she should sail the course and the fleet is ranked against a fictional ‘scratch boat.’ This assumption is ‘challenged’ by a variety of race-specific climatic and oceanographic conditions. Ocean races of long duration will typically experience these varied conditions. Whether it’s wind deflection and strength between inshore and offshore positions, the crossing of a known directional current, or the historical location of a high-pressure gradient, the likelihood of predictable conditions for an entire multi-day race is little to none. Because of these differences, the Marion Bermuda Race is attempting to take one of these conditions that has shown itself to be a real and consistent detriment to what one might feel is a fair race based solely on a boat’s handicap and include another factor that adjusts across the fleet. In the case of the Marion Bermuda Race (or any race to Bermuda), it’s the Bermuda high-pressure gradient. 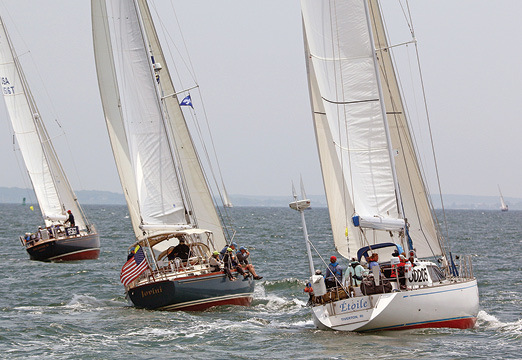 For the 2019 Marion-Bermuda Race, which starts June 14 in Marion, MA, the race committee proposes to calculate a “parking” time for each of the first three finishing yachts. The “parking” time of each of these yachts is the difference between the yacht’s elapsed time and her predicted time. The “parking” times of the first three yachts to finish are averaged. This derived “Parking Effect” time is subtracted from every yacht’s elapsed time. The reduced elapsed time is handicapped with the yacht’s ORR rating to produce the corrected time used for scoring. If the “Parking Effect” situation does not occur, the condition adjustment calculation will not be applied. Applying this formula to the race results for 2009 to 2017 showed quantifiable reduction in bias. If you have any questions regarding this change to the Marion Bermuda Race scoring, please contact the Principal Race Officer at race@marionbermuda.com. This will be another exciting year of growth and expansion for the New England Science & Sailing Foundation (NESS), a Stonington, CT-based ocean adventure non-profit organization that provides STEM-based education programs, on and off the water, for students from all walks of life. Last November, the New England Association of Schools and Colleges (NEASC) voted to accredit NESS as a school partner program. “This decision makes NESS the first school partner program to be accredited by the oldest accreditation agency in the country,” said Caroline Knowles, Assistant Director of Advancement, PR & Communications at NESS. “We sought accreditation to demonstrate our commitment to providing the highest quality educational experience for all students, complementing and enhancing students’ traditional school experiences.” The accreditation process combined with the peer review will help NESS continue to advance its mission, vision, core values, and curriculum to address the ever-changing educational landscape. NESS will continue to build relationships with New England schools and looks forward to a busy rest of the school year! 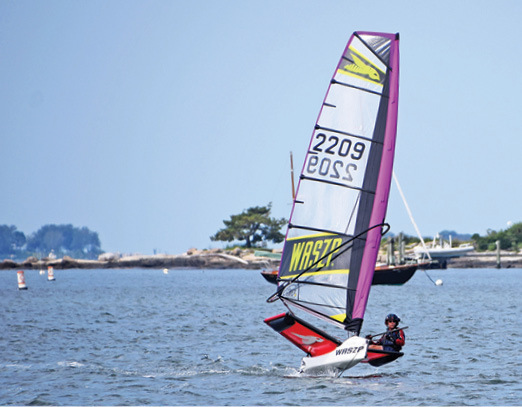 Consistent with their mission of being inclusive, NESS is expanding their adaptive sailing offerings in 2019. Through their adaptive sailing program, NESS provides access to the ocean and takes students out of their comfort zones for personal growth and empowerment. Their adaptive teaching methods and specialized equipment support individuals with a variety of cognitive and/or physical disabilities. Using their adaptive-ready, specifically designed Independence 20, students with physical and cognitive disabilities will safely learn to sail with an experienced captain and teacher. NESS is hosting their annual community event, “NESS Fest,” on Saturday, June 22. This fun, family-oriented celebration includes free activities including sailing, kayaking, and stand up paddle boarding. NESS summer programs for kids start on June 24 (online registration opens February 1). Check out nessf.org for more information. 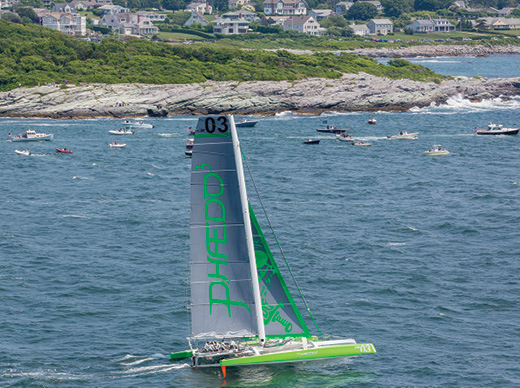 The latest edition of the world’s oldest oceanic race sets sail from Newport, RI on Tuesday, June 25. Organized by the Royal Yacht Squadron, New York Yacht Club, Royal Ocean Racing Club and Storm Trysail Club, the Transatlantic Race was first run in 1866. The quadrennial race charts a 2,960-nautical-mile course from Newport to Cowes, England. The 2019 edition has some modifications to its format. There will just be one start, on June 25, with a first warning signal at 1100 EDT. The course will run across the North Atlantic to a finish off the Royal Yacht Squadron in Cowes. A gate will be included off the Lizard, as the Newport-Lizard course has been established as a record course with the World Sailing Speed Record Council. The present race record time of 6 days, 22 hours, 8 minutes and 2 seconds was set by George David’s maxi Rambler 100 in 2011. While in theory the route follows the prevailing winds, typically conditions are extremely tough, from the scary shoals and fog off the New England coast and the Grand Banks to the profound cold and humidity midway, to the tricky tides around the headlands along England’s south coast. Competitors will likely meet at least one gale on the way across. The Transatlantic Race 2019 once again will form the central part of the Atlantic Ocean Racing Series 2019. Other components of the series include the RORC Caribbean 600, Rolex Fastnet Race, Rolex Middle Sea Race and a new addition, the Antigua Bermuda Race. Of these, participation in at least three, including the Transatlantic Race, is mandatory. The Transatlantic Race is open to IRC yachts, classics, superyachts, multihulls, IMOCA 60s, Class40s and other open class yachts with a LOA no less than 40 feet. Recent editions have attracted some of the world’s fastest multihulls and monohulls including Lloyd Thornburg’s MOD70 trimaran Phaedo 3 and Kristy & Jim Clark’s 100-foot maxi Comanche, which respectively claimed multihull and monohull line honors in 2015. Superyachts have taken part, including the 270-foot Maltese Falcon and Sir Peter Harrison’s 105-foot Farr ketch Sojana. Several of the world’s most magnificent classics have competed, including Mariette of 1915, which, a century on from her first launch, finished a remarkable third overall under IRC in 2015. While the grand prix boats and sponsored programs grab the headlines, the vast majority of entries are more modest: crews, families, and cruisers just wishing to be part of yacht racing history. All are welcome. Pre-start activities will take place at the New York Yacht Club’s Harbour Court clubhouse in Newport, while awards will be presented at the Royal Yacht Squadron’s Cowes Castle clubhouse on the Isle of Wight. The Notice of Race, entry information and an archive of race documents, results, blogs, photos and videos from 2011 and 2015 can be found at transatlanticrace.org. Transatlantic Race 2019 Press Officer Stuart Streuli contributed to this report. Our friends at Clean Ocean Access, a Middletown, RI-based non-profit organization with a mission of action today so future generations can enjoy ocean activities, and 11th Hour Racing, a Newport, RI-based organization that establishes strategic partnerships within the sailing and maritime communities to promote collaborative, systemic change benefitting the health of our ocean, have launched an innovative multi-year project. 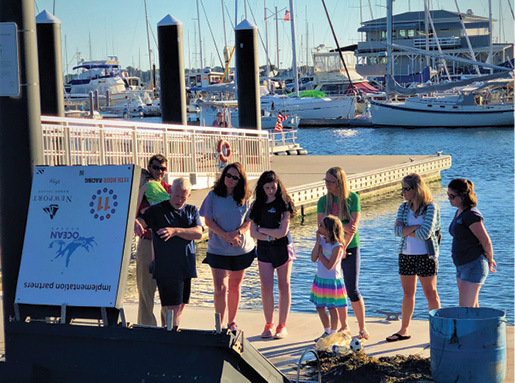 Healthy Soils, Healthy Seas Rhode Island aims to inspire long-lasting environmentally responsible behavior by tackling ocean pollution at its root: on land. Grant funding from 11th Hour Racing allows Clean Ocean Access to subsidize the composting programs and offer discounted rates to the first round of customers who sign up through Healthy Soils, Healthy Seas RI. The initiative brings together diverse stakeholders that include non-profit organizations, academia, government, local businesses, and industry with the hope of expanding an integrated materials management initiative throughout Rhode Island. “Every day, organic waste is disposed of in landfills where it generates greenhouse gases that warm our planet and are detrimental to ocean health,” said Michelle Carnevale, Program Manager at 11th Hour Racing. “Healthy Soils, Healthy Seas RI is a wonderful initiative that allows the community to come together and collaborate on an effective, and simple, solution.” For more information about how to join the first wave of participants turning the tide on ocean pollution, visit cleanoceanaccess.org/hshsri/. Gloria Kostadinova, Communications, Marketing & Events Coordinator at Clean Ocean Access, contributed to this report. 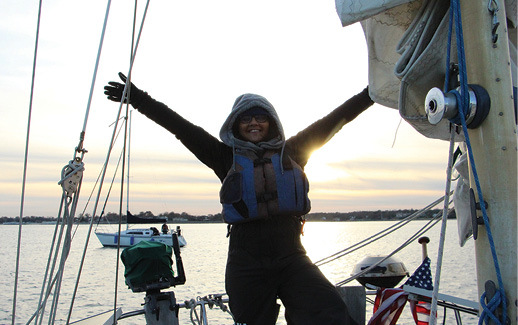 Founded in 2007 with a mission to develop leadership and academic success in underserved New York City youth through sailing education and provide maritime education and recreation to the community at large, Hudson River Community Sailing (HRCS) partners with public schools to offer credit-bearing academic programs, internships, mentoring, and college readiness. Sail Academy is HRCS’s after-school program for public school students that uses sailing as a platform for STEM and leadership education. Students have the option to earn academic credit in math, science, and physical education. As students progress through the program, they gain more independence and have the opportunity to specialize based on their interest. They choose between elective tracks taught by various HRCS staff in areas of expertise including racing, passage making, engine maintenance, and boat building. This past fall, 20 students enrolled in the Explorers track, where they learn to plan and execute overnight sailing trips. The Explorers are studying the fundamentals of weather and navigation this winter, and planning a longer voyage in the spring. To learn more about the youth and adult programs, racing, community regattas, veterans programs and more at HRCS, visit hudsonsailing.org. The first winter-season boat show in the Northeast has a brand new venue. The 50th Hartford Boat Show Powered by Evinrude, organized by the Connecticut Marine Trades Association, will be held from Thursday, January 17 to Sunday, January 20 at the Expo Center at Mohegan Sun in Uncasville, CT. Hundreds of new powerboats, sailboats, kayaks, inflatables, engines, electronics, fishing equipment and more will be on display in the 125,000 square foot Expo Center, along with a full schedule of boating and fishing seminars. Owned by Mohegan Gaming & Entertainment, Mohegan Sun is one of the largest entertainment, gaming, dining and shopping destinations in the United States. 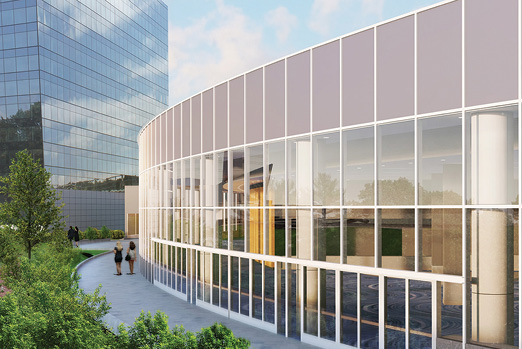 Situated on 185 acres along the Thames River, Mohegan Sun has 1,600 deluxe hotel rooms, two world-class spas, a golf course, over 90 shops, restaurants and bars as well as three award-winning entertainment venues including a 10,000-seat arena. More information can be found at mohegansun.com. For more information about the Hartford Boat Show, visit HartfordBoatShow.com. First Beat Strategy: Go the Right Direction!